Nhlanhla Sicelo Mngadi (47) speaks passionately about farming. To him the most exciting thing about being a farmer is seeing growth whether it is the maize on the field which has grown from a seed or a calf growing into a mature animal. ‘It is wonderful to see the change taking place in nature. It is as if nature is giving back to you when you farm,’ he adds. This nature-loving subsistence farmer farms on 43 hectares in the Estcourt district in KwaZulu-Natal. His farm is situated in beautiful surroundings near the Bushman’s River on the way to Giant’s Castle. 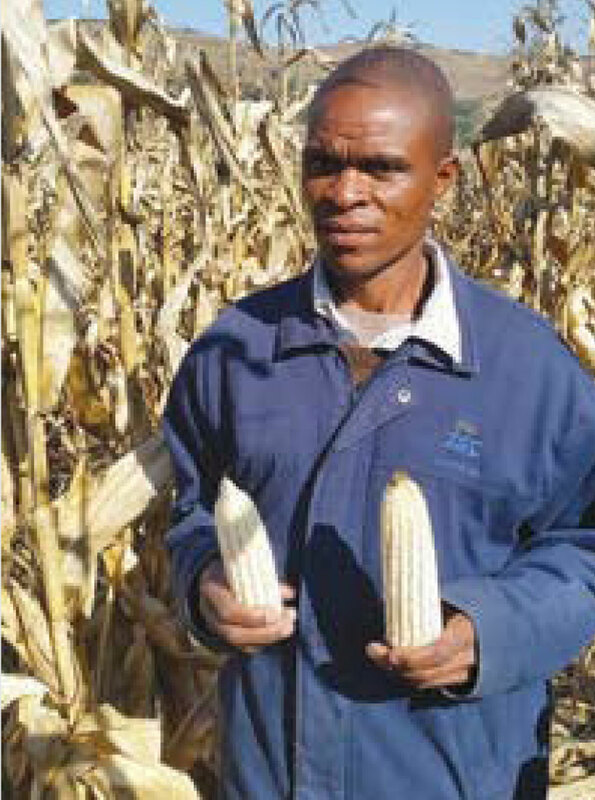 He owns some cattle and cultivates maize. During November 2016 he planted 9 hectares of the 18 hectares of arable land. His short term goal is to plant the total 18 hectares within three years. Although the drought has prevented him from planting any vegetables (cabbages and tomatoes) this season, he believes that as it has already rained it is going to be a better season than the previous one. To Nhlanhla the term agricultural industry comprises not only commercial producers but the variety of smallholder and emerging farmers as well. It also includes anyone who is involved in the food chain – those who market the farmer’s produce, the relevant government departments and the financial institutions who supply resources to assist farmers with production. The companies and representatives of all the other agricultural products – whether it is mechanisation or seed and herbicides – all form part of this large industry ensuring food security. He realises that the role he plays in the agricultural industry may be small. However, he knows that he is adding value as he is helping to put food on the table of people in his community with what he produces and sells at the local market. Without his contribution there would be less food available in that area. If there is one change he would like to see implemented it is the way the Department of Agriculture, Forestry and Fisheries works with farmers. He feels that a different approach is needed where government officials visit farmers on their land so that they can discover what the real need is on ground level. ‘It seems that the department has decided farming should be done in a certain way, but experienced farmers know that that way isn’t viable. I don’t think the department understands the struggles farmers are confronted with and the problems we face from one season to the next,’ he shares. Nhlanhla says developing farmers especially have been struggling for a long time and although the government has offered some assistance the funding provided for these projects has been wasted and no results have been delivered. ‘Funding from the department isn’t awarded to the people who need it and are working hard,’ he adds. When asked if funding was the biggest need amongst subsistence farmers, he quickly answers: ‘No, funding on its own won’t help. Subsistence farmers need mentorship almost more than funding’. He praises Grain SA for their mentorship programme: ‘Grain SA came with a different approach than the department and made a big difference,’ he says about the hands on approach of the Grain SA Farmer Development Programme. According to him this programme develops skills and is initiating growth in the agricultural industry. Nhlanhla is married to Thembile and they have three children, two sons and one daughter. His long term goal is to be able to purchase his own implements and have enough equipment available to produce more food and increase his income. His dream for agriculture in South Africa is that more time, energy and funding will be invested in the agricultural industry. It is said what you help a child to love, can be more important than what you help him to learn. Nhlanhla is sure if agriculture is promoted at school level with the passion he has for this career, more young people will become interested in making agriculture their career choice after the completion of their schooling. He is already encouraging his sons to join him on the farm after the completion of their education by cultivating a love for agriculture.